Over the years, as hundreds of StreetSquash alumni have graduated and left the building while starting new adventures in college and beyond, they tend to surprise us with unique and meaningful connections back to us. One student who embodies this is Yushishia, a member of the StreetSquash Class of 2013 who was recently honored at the Child of Peace Awards held by Catholic Guardian Services, a foster care provider in New York City. As a young person, Yushishia spent her time learning and growing not only at StreetSquash, but also in Catholic Guardian Services’ care. During this time, Yushishia was a dedicated member of the StreetSquash community, having joined in 7th grade and hit the ground running on and off the squash court. Yushishia would be the first to tell anyone that her commitments to StreetSquash helped her become who she is today. She was a founding member of the Student Leadership Committee at StreetSquash, and a top squash player. 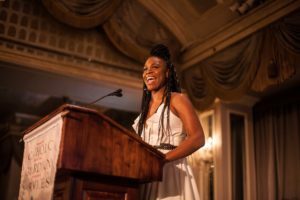 In her National Teams and Individuals Essays during high school, she often focused her responses on the ways in which squash helped her focus in school and expand her exploration of identity as a young African-American woman in New York City. She drastically improved her grades throughout high school and cited StreetSquash as a positive in that process. Throughout her time as an alum of both StreetSquash and Catholic Guardian Services, Yushishia has actively given back to both programs recently attending our Community Squash Night as a coach and working to improve educational services for youth with Catholic Guardian Services. We are so proud of Yushishia and honored to be a part of her journey now and in her bright future!